An amazing sculpture is made by pouring molten aluminum into a fire ant colony. The resulting cast is huge, weighing 17.9 lbs. and reaching a depth of 18 inches. Dec. 9, 2013 — Bumblebees look cute. They have a thick fur, fly somewhat clumsily and are less aggressive than honeybees or wasps. They are very much appreciated by farmers as keen pollen collectors. Particularly in the context of the crisis-stricken honeybee populations, the buff-tailed bumblebee, Bombus terrestris, is being bred on an industrial scale for the pollination of fruit and vegetable crops both inside and outside greenhouses. It was hoped that these insects would take over these important services when they were first introduced into central Chile, in southern South America, in 1998 as pollinators in a few greenhouses, with the backing and approval of the state authorities. But in the greenhouse, they did not stay. Some individuals escaped and very soon they established colonies in the wild. But that was not all. The buff-tailed bumblebee turned out to be an extremely invasive insect that embarked on an unparalleled victory tour that took it as far as Patagonia. As an aside, the first European bumblebee species, Bombus ruderatus, was introduced back in 1982 but it turned out to be relatively harmless in comparison. “This is one of the most spectacular examples of the invasion of an entire continent by a foreign species introduced by man,” says Paul Schmid-Hempel, retired Professor of Experimental Ecology at ETH Zurich. 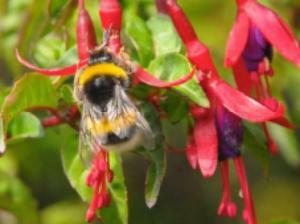 He has been monitoring the spread of buff-tailed bumblebees over the last ten years. Together with this wife Regula and his colleagues from South America he has just published his work in Journal of Animal Ecology . The couple collected these insects during several trips to southern South America in order to document their rapid spread, do genetic analyses and examine the parasites which accompany them as stowaways in the bumblebee intestines. The findings show that the European buff-tailed bumblebee spread southwards from central Chile along the Andes at a rate of around 200 kilometres a year — faster than the ecologists would ever have expected. After just a few years the buff-tailed bumblebee had crossed the mountain chain and it reached the Atlantic coast of Argentina in late 2011. By 2012 the insect had already penetrated deep into south Patagonia reaching the gateways to some of the major national parks. “Given that colonies and not individual insects have to become established, this migration speed is astonishingly fast,” says Paul Schmid-Hempel. He is convinced that in just a few years’ time the bumblebees will reach the Strait of Magellan. From there it would be just a little leap to Tierra del Fuego. “Unfortunately, we don’t have any information at all about the occurrence of bumblebees on this large island,” comments the researcher. In the other poorly accessible areas in Southwestern Chile no-one has looked for buff-tailed bumblebees either. That’s why we don’t have any evidence up to now. As, however, there are often strong winds in Patagonia in the summer, Schmid-Hempel believes that it is possible that the insects could be transported easily to many locations. The triumphant advance of the European bumblebee is a disaster for the native bumblebees — five out of a total of 250 bumblebee species to be found in the world live in southern South America — and a disaster particularly for the attractive and vivid orange giant bumblebee Bombus dahlbomii. Wherever the buff-tailed bumblebee settles, the native species are done for: in most areas in which its competitor has appeared, B. dahlbomii has disappeared surprisingly quickly. One possible reason for its extinction is the protozoan parasite, Crithidia bombi, which lives in the intestines of the buff-tailed bumblebee. This parasite causes intestinal infections in the European and native bumblebee species in South America. It modifies the behaviour of the workers, increases their mortality rate and prevents the establishment of new colonies. Paul Schmid-Hempel is worried about the rapid spread of the buff-tailed bumblebee in remote areas of southern South America not least because nothing seems capable of stopping it. The species is now established and it would be almost impossible to remove it from the ecosystem. The consequences for the native fauna and flora are, however, difficult to assess. “The European bumblebee could disrupt the ecological balance of southern South America to a major degree. Nor is it stopping either at the boundaries of famous nature reserves like Torres del Paine and other magnificent landscapes,” stresses the ecologist. “Undoubtedly one of the most courteous, personable and professional techs visited our property today (24 unit condo building), and his name was Dean M.
After wasting a 4-hour window on a Saturday morning for another pest control company who never even made it by (no call), it was refreshing to have someone who really stood out as being an honest, good person, who was out to do a good job, and not just a “good enough” job. Purchase proper storage: Heavy plastic or glass containers with airtight, secure lids keep pantries looking nice and will help protect food. Use a bay leaf: Add one leaf to canisters and packages of dry goods – the herb’s pungent scent repels many pests. Inspect groceries at the store: Most pantry pests are brought into homes from items that are already infested. Check packages for any holes or broken seals before placing them in the cart. Check the date: Remember to check expiration dates on baking ingredients before use. Visually inspect items that have been left untouched in the pantry for signs of pests. Practice good sanitation: Wipe up crumbs and spills as soon as possible. Also, periodically clean cupboards with soap and water to remove any food residue that may accumulate over time. Seal cracks: Look for any cracks or holes where pests might be coming into your home and seal them shut. Insects prefer to eat green leaves rather than red ones, research from Victoria University has shown. Ignatius Menzies, who will be awarded a PhD in Ecology and Biodiversity next week, tested a long-standing hypothesis that plants use red foliage as a visual warning to deter approaching insect pests. Ignatius was part of an international team of researchers from Victoria University of Wellington, the Plant Extracts Research Unit (Plant & Food Research) in Otago and the University of Freiberg in Germany, which carried out the study using horopito, the New Zealand native pepper tree. Earlier work on the topic had shown that redder leaves contain higher levels of an unpalatable defence compound-”the redder the leaf, the more peppery the taste,” says Ignatius. His research involved spending a lot of time in the hills of Lower Hutt’s Belmont Regional Park, an area with a rich population of horopito. He studied 30 pairs of plants that were identical except for one being coloured red and one green. Ignatius checked every leaf for caterpillars, quantified leaf damage and counted the fruit produced by the plant. Back in the laboratory, he examined levels of pigment and the defence compound, assessed whether the leaves had nutrient deficiency and carried out choice tests with typical eaters including leaf-roller caterpillars, stick insects and weta. “The redder plants had 20 percent fewer caterpillars-it was clear the caterpillars much preferred to eat the green leaves,” he says. His research concluded that although redder-leaved bushes can defend themselves better against insect attacks, contrary to expectations, they do not produce more fruit or seeds than the green bushes. Professor Kevin Gould, who supervised Ignatius’s research, says: “This work makes a significant contribution to our knowledge of how plants can defend themselves from the incessant onslaught from insect herbivores. If you are considering bringing “secondhand” furniture to campus, properly inspect it to ensure that a pest problem, such as bed bugs, is not the reason for its “secondhand” status. If you see anything suspect, do not bring it to your dorm, apartment or house. Repeat these steps after every return trip to and from campus, whether it be for weekend get-aways, trips home and especially when returning from holiday and Spring Break. A company spokesman confirms that: “The updated website and its wide range of new products will be welcome news for the many collectors of specimens, education institutions, and even film and media production companies, who all find us an invaluable resource”. There is also an unyielding commitment to ethical sourcing: “Customers rightly expect us to behave responsibly in what is a sensitive area for some. For example, our wide range of butterfly taxidermy products is only possible because this helps support the farmers in countries from Malaysia to Madagascar to invest in their environment, rather than simply to harvest it”. One of the stunning products added to the extensive range at http://www.BugsDirect.com is the Giant Bird Eating Tarantula. With a typical adult legspan reaching 15cm, it inhabits burrows deep in the tropical rain forests of southeast Asia. This superb captive-bred specimen is presented in its own silk-lined box frame, complete with wall mount. It will certainly provide a sensational gift for any keen collector or enthusiast. Over 100 individual insects and varied exotic collections are available through the new BugsDirect.com website. These mounted pieces are often referred to as “insect art”, reflecting as they do both the intricate detail and often vibrant colours of the exhibits. The “art” connotation comes more to the fore with a series of eye-catching creations, for example using a series of butterflies to create some stunning visual images, far removed from a simple presentation of specimens. There is a wide selection of products to cover many tastes, including: moths, beetles, scorpions, stick insects, cicadas, dragonflies, and others – plus examples of both reptiles and amphibians. These are shown to outstanding effect through the use of double-glass frames – either see-though or wooden. Simple box, traditional cotton-mounted, and silk-lined insect frames are also popular. BugsDirect.com regularly provide anything from individual gift or collector items, to larger installations required by interior designers. These are often needed when producing natural history displays, typically made up of hundreds of items, together with the relevant scientific information for museums. For more than twenty years, the company has also supplied insects for films, artists, wildlife parks and fashion designers. Edible bugs and insects are also available through their sister website http://www.edibleunique.com . Unless a roof business is licensed make sure that, they ought to not set foot on your home. With the unlicensed service provider there is a big danger of property burglary, property damages and injury are involved. We are licensed roofers and provide just the insured services to our clients. It holds true that roofing products are ensured by the manufacturer’s warranty, but work of roofing is ensured only by the professional’s guarantee. If a roof is set up improperly, and professional didn’t provide any guarantee, constructing owner will be not qualified for getting any payment for malfunctioning work. So, never ever hire a service provider, who didn’t give you warranty or guaranty for malfunctioning work. We are among the leading Cincinnati roofing professionals and offer assured roof services. Consumer feedback is vital details through, which one can know about the quality of specialist work. A bad roofing system will buckle, leak, and reveal various other signs of bad work quickly and a customer feedback can expose the truth of a roofer. It is highly suggested that if the references of a specialist are not satisfying then don’t make use of that kind of specialist for your roofing. You can examine our customer references and surely you will get satisfied with the services that we supply to our consumer. Always remember that roofer, who do not have any long-term address, are dangerous to employ. A specialist, which lacks for a long-term company address in an area normally, does not have a steady. customer base in that area. They do not have in dedication to supply quality work, as they have no reputation to keep. We are one of the very best roofer Cincinnati and this is the reason, why we works for our consumer satisfaction and for maintaining our track record. There are numerous kinds of industrial roofing systems, and all roofing professionals are not expert in all of them. For that reason, it is necessary that you choose an expert contractor for your work. Roofing technology is changing day by day and a service provider who is specialist in type of roofing system you need should be up to date on handling all the most recent technology that can be used at the time of work. After working for so lots of years our expert group supplies the total solution for all sort of roof style and manages all the current innovation that can be made use of at the time of roof and maintaining. Looking to Buy A Skateboard? Inexpensive skateboards are something everybody is wanting to discover, however there is a difference between low-cost skateboards and economical skateboards. Skateboards made from inadequate quality product which will break and cause parts to be changed more often then required, not to discuss skateboards with bad quality will not be as safe for you to use. Skateboards that are affordable would be made from excellent quality material, suggesting it will do better and last longer, however it does not cost as much as some of the various other skateboards specifically if you are in the marketplace to buy a skateboard. The two typical types of skateboards are the conventional and the longboard. The ways you can discriminate in between the 2 are the lengths of the decks. The standard skateboard is utilized even more frequently and is normally shorter than 33 inches, makings it simpler to control for techniques and ramps. The longboard is typically over 35 inches and is most commonly used for cruising. An additional thing you need to consider is the depth of the curve on the board; a deeper curve is going to permit you to master tougher tricks. A shallower board is more for novices, which will make tricks easier for you and will be a lot more secure beginning out. When searching for low-cost skateboards as a beginner, the very best thing to do is purchase skateboards that are already put together. For beginners, prior to you start skateboarding, you will require to know a skateboard has 4 main parts. The first part is the deck, which is the part you will be standing on, next the trucks and wheels which go underneath the deck finally the bearings which go inside the wheels.